International Journal of Research in Health Sciences,2015,3,3,393-399. 1-Assistant professor, Department of Radiotherapy, Govt Medical College Jagdalpur (CG), INDIA. 2-Associate Professor , Department of Radiotherapy, Regional Cancer Center Raipur (CG) , INDIA. 3-Director Professor, Department of Radiotherapy, Regional Cancer Center Raipur (CG), INDIA. 4-Professor, Department of Radiotherapy, Regional Cancer Center Raipur (CG), INDIA. Introduction: The worldwide incidence of head and neck cancers exceeds half a million cases and ranked 5th most common malignancies and varies widely throughout the world, about two thirds of them arising in developing countries. Squamous cell carcinoma and its variant represent more than 90% of all head and neck cancers. Vinorelbine is a unique semi synthetic vinca alcaloid and is a cell-cycle- dependent antimitotic agent blocking progression in the G2/M cell phase, which is the most sensitive phase of the cell cycle to irradiation. Materials and Methods: The present study was conducted on patients reporting to Department of Radiotherapy, Pt J.N.M. Medical College and Dr. B.R.A.M. Hospital Raipur (C.G. ), India from September 2005 to June 2006. All patients taken in to study were randomized in to trial arm and control arm. In trial arm patients were monitored during vinorelbine infusion for any infusion reaction and reviewed at once a week during the course of chemo-radiotherapy for documenting acute toxicity. In control arm patients were monitored weekly during the course of radiotherapy. Results: Patients evaluated in this study belonged to the age from 30 to 70 years with the median age of 50 year. In both arms 44(73.3%) patients were male and 16(26.7%) patients were female out of 60 patients. 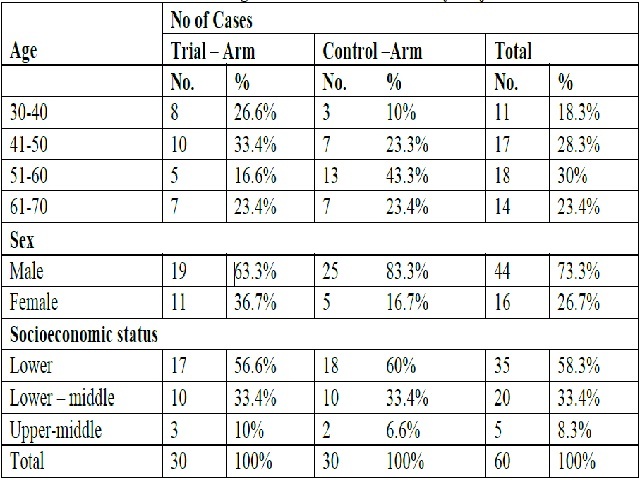 When response were evaluated after 6 months of follow-up in both arms it was found that in trial arm 18(60%) patient had loco regional control and 5(16.7%) had persisting disease as compared to 12(40%) and 9(30%) patient respectively in control arm. It has been observed that earlier stage disease is better response. Conclusion: Treatment response was significant better among patients with early stages. The chemotherapy regimen used in this study gives acceptable results and toxicities. Even though the length of follow up in our study was short the responses have shown encouraging results.